Dear Uganda, it's not that I don't care anymore. It was with a heavy heart that I chose not to renew the website I created three years ago on New Year's Eve, "UgandaUrgentAction.com." It's time for quiet diplomacy and prayer. 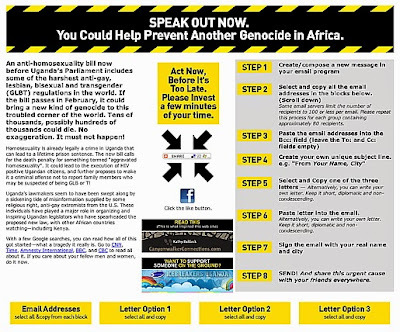 Earlier that December 31, 2010 I read a blog post by my friend Kathy Baldock titled: "Genocide brewing in Uganda." It dealt with the infamous "Kill the Gays Bill" that was being debated in Uganda's Parliament and its passage seemed eminent. It upset me deeply and I decided to write an open letter to all 287 members of parliament, the President, the Prime Minister, and both the Cabinet and the shadow cabinet. Why I don't look forward to Christmas, but really want to. Have you ever considered the irony in the Christmas story with respect to family? Luke tells us "a decree went out from Emperor Augustus that all the world should be registered. All went to their own towns to be registered. Joseph went from the town of Nazareth in Galilee to Judea, to the city of David, called Bethlehem, because he was descended from the house and family of David. He went to be registered with Mary, to whom he was engaged and who was expecting a child." Whether this census really took place in exactly this way is debatable. It may have been a more localized census, affecting only the Province of Syria, which included Judea.